I am going to be very interested in knowing how much exercise I will get on the boat during a regular day. 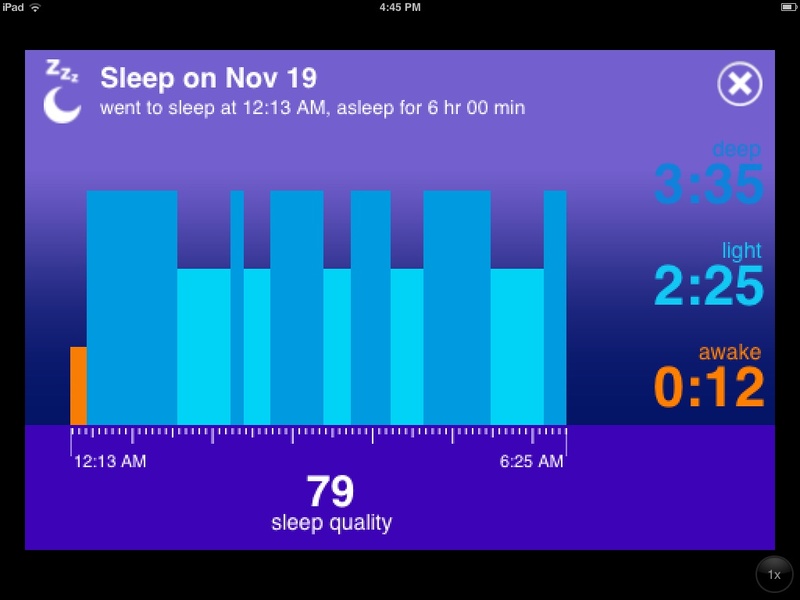 I found the most amazing gadget that tracks my daily activity and sleep patterns. 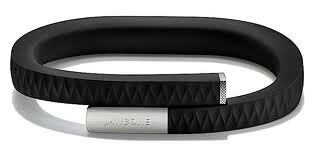 It is called the UP and it is made by Jawbone. Click this link to get more details. So, I bought it from Apple for $99 and synced it with my iPhone. Then, I put it on my wrist and I wear it all day and during the night. It is supposedly waterproof but I have been removing it for my shower or for doing the dishes. I have tracked my activity and as you can see by the pictures, it does a great job of tracking. Now, I haven’t done any biking, kayaking or swimming but it seems very accurate. I also have a Garmin 410 Forerunner sport watch which actually sends a signal to a satellite, so it is great for serious training outside. I will write about that next week. What I like about the UP is that it tracks your activity inside, so I discovered today that in addition to my run, I also walked over three kilometres. The UP looks fairly attractive as it looks like a bracelet. I bought the black one and it has a bit of silver coloured metal on it so it matches my earrings! I do find though, that when I am at the computer typing, I have to take it off because it elevates my wrist and it feels awkward. I have found that when I am trying to change my clothes, it is best to remove it because it catches on the sleeves. Of course in the summer, I won’t have to worry about that as I plan on wearing my bathing suit most of the time! In order to sync the UP, it is really quite ingenious! You take the end of the bracelet off and a headphone jack is revealed. Then, you insert the headphone jack into the phone and press the sync button. It takes about 30 seconds to sync. 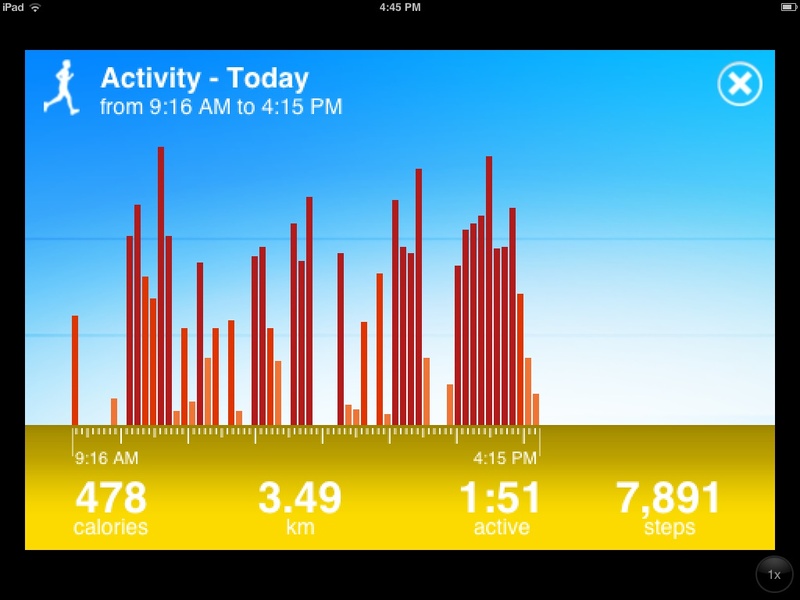 Then you can track your activity. It is really very simple to do. I also sync it to the iPad so that I can actually see my progress more clearly. It will update both the iPhone and the iPad without having to physically sync each one. I am not really using the food tracking. I find it a bit ridiculous as all you do is take pictures of your meal and then it asks you how you feel – full, happy, sleepy… So, that part does not get used much. All in all, I think it is going to be a lot of fun! As long as I keep using it and tracking my activity, I think I will really enjoy it. Like all my other gadgets though, this is the “honeymoon” stage and I’ll use it like crazy for the first while until the novelty wears off. By then, there will be a new and improved activity tracker on the market and I’ll be able to wear this as jewellery!